As the arrival of spring begins to warm up bass waters across the nation, the time to employ one of my favorite methods for catching a bass is fast approaching. And that's because buzzbait season is here, the time when noisy eggbeaters that clack and rattle their way across the dimpled surface of the water draw smashing strikes from a bass lurking below. Buzzbaits – buzzers, as some call them – can drum up a strike from a bass as the pre-spawn turns into the spawn, as the spawn turns into the post-spawn, on a moonlit summer's night or in the fall when fish are feeding up for wintertime. In short, there aren't many times of the year when a bass won't take a swipe at the slowly gurgling bait as it splashes its way by cover and vegetation holding a bass looking for a quick meal. 1. Ditch the skirt: Some pros on the professional bassing circuits feel like the skirts on buzz baits are too air resistant and make them harder to throw a considerable distance. Which explains why some of them choose to take the skirt off of a buzzbait entirely. Other anglers will replace the rubber skirt with a shad or bluegill like soft plastic – or even a Strike King Rage Tail Toad – to alter the bait's profile as it is retrieved. 2. Or add a bulkier skirt: Other bass fishing pros feel like the skirts on buzzbaits straight out of the package aren't thick enough to help create the drag necessary to make it possible to slowly crawl a bait back to the boat, so slow that a bass finally can't stand it. 3. Add a trailer hook: Like spinnerbaits and hollow-bodied plastic frogs, bass can sometimes be just aggressive enough to swipe at a buzzbait trailing by over their head but not so much that they get hooked. If that happens on a day when you're tossing a buzzbait, add a trailer hook to the lure and see if your hook-up ratios don't increase. 4. Make some racket: Most anglers agree that the more irritating a buzzbait can sound with squeaks, squeals and clacking, the more often a bass will take a swipe at the bait. 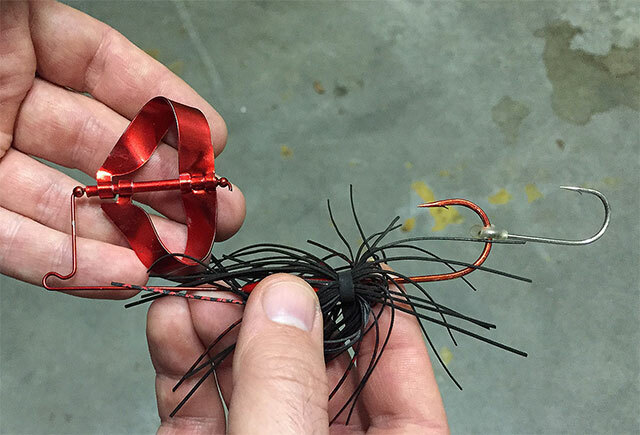 Clacking starts with buying a bait with a built-in clacker already attached or in bending the wire holding the blade(s) a bit closer to the lead-head. Making a bait squeak – or squeal as some call it – can be achieved one of several ways. The first is to use the bait a lot since simple wear and tear will gradually enlarge the hole of the rivet holding the blade(s) in place. A second method is to remove the rivet, slightly crimp the ends (just barely, not too much) and use a file or sandpaper to rough up the portion of the wire that will make contact with the crimped rivet. A third – and more humorous – method to accomplish all of this is to drive down the highway with the buzzbait hanging out the window as the blades spin wildly and wear the rivet down more quickly. And a final method some use is to soak the rivet and the end of the wire (not the blade) in a saltwater solution to create some noise-making corrosion. However you get your eggbeater to be a bit more noisy and obnoxious as it rattles across the surface of the water, the better off a bass will tend to like it. 5. Drill holes in the blades: Use your drill and a fair-size bit to drill a hole in each one of the blades of your buzzbait. Doing so will help the bait produce some bubbles that trail behind it and give a bass even more reason to consider swatting at the bait as it rolls overhead. 6. Tune the blade(s): By bending the wire a slight bit to one side or the other, you can influence the way that a buzzbait tracks across the water's surface. That can be a key consideration as you wind the bait back since running it into objects like a stump, a dock post or a clump of vegetation can be enough to finally trip the trigger of a bass and cause it to strike. While buzzbaits are an old school bait that sometimes get lost in the shuffle of all of the new space-age lures and techniques that exist today, the time tested eggbeaters aren't ignored by the bass on your local lake. Especially if you make a few of the modifications listed above. And then drag it slowly by the dark and shadowy spots that the bass are sulking in. Because when the surprise blowup occurs, it's one of the best – and most enjoyable – heart stress tests that money can buy.